I know next to nothing about Wonder Woman. In the looming presence of her cinematic debut, that seems a shameful thing. I have been learning, however, and it’s an enjoyable process. To get nerdy for a minute, this ignorance is rooted completely in her being a DC superhero. As can be insinuated in many posts on this website, I grew up a Marvel fan, specifically an X-Men fan. Their plight and dynamic really spoke to me to the point that, to be honest, DC Comics barely registered on my radar. As I dive into Wonder Woman’s canon and continuity, however, I’m surprised at how not normal it seems. She’s a hero, yes, but there are a lot of gods involved and mythology so that, as stated by Nicole when reading the first two volumes of the New 52 Wonder Woman reboot and after watching the 2009 animated film, Wonder Woman seems to have more kinship with the literary and mythology heavy Vertigo series, Sandman, than it shares with Superman or Batman. Her world immediately feels deep and rich and epic where Superman and Batman are firmly rooted (for the most part) in traditional tropes and ideals. 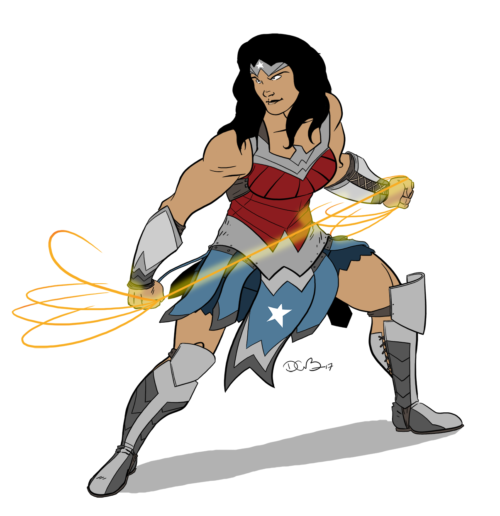 However, I would argue that Wonder Woman is the most inclusive hero, especially for adults. I’m not the first to say this (though I was pleased to hear well-informed Wonder Woman fans agree) but unlike Batman or Superman––heroes who were either traumatized into heroism (the former) or raised in the throbbing heart of traditional American values (the latter)––Wonder Woman’s heroism is a conscious adult choice that she made, no matter where you pull her from along her timeline. There is idealism there, but it’s always a pragmatic, logical choice on her part to protect and fight for those who cannot, because she has the ability to stand a chance against the larger oppressors. DC’s male heroes are more or less indoctrinated into their positions; Wonder Woman is an outsider who comes to America and sees the world before her, weighs the options, and decides, “This is worth protecting.” It’s a remarkably adult and mature stance and is, as I’m learning, what really makes her stand above her DC brethren, at least. This drawing was a lot of fun to do. For the first time in a long time, I was caught up in the experience of drawing, excited to lay down each line. Another milestone this drawing marked was that it is wholly digital, working with my Wacom tablet to get the lines to connect and make art happen. I haven’t drawn fully digital in years. For Long John, the computer is only used to color (as much as that is done) and letter, but it was a conscientious choice to do all the art of the comic physically so as to not rely on the computer as a safety net or crutch (which is easy to do). However, sidling up to the monitor and tablet, if even for just a short while, was energizing. 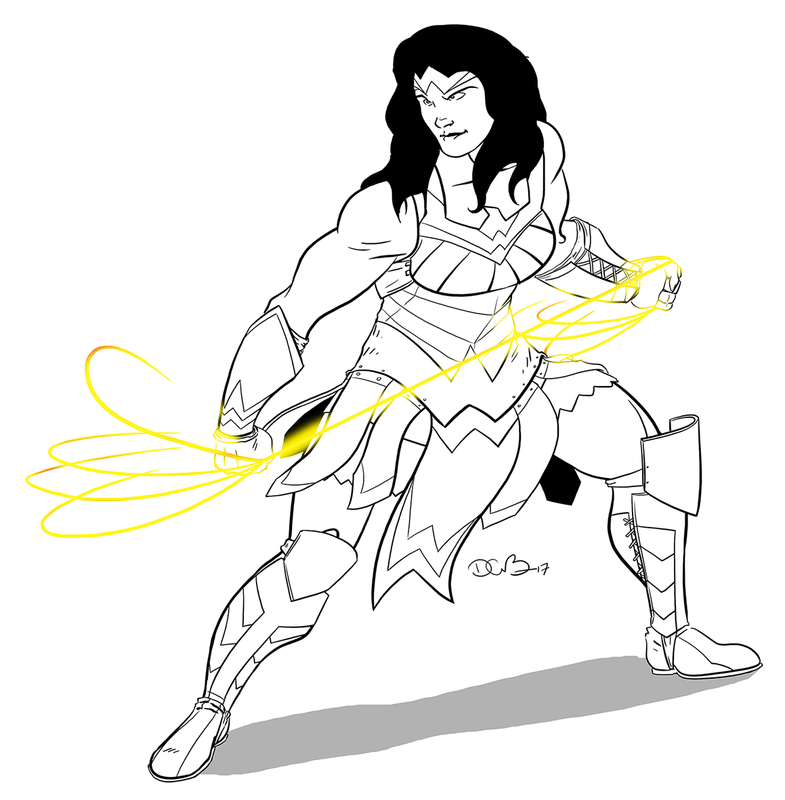 What excited me most about the drawing was blending together the aspects I liked most of different Wonder Woman costumes into regalia I felt represented her best. She is a Greek goddess but also a modern hero. She has her lasso to subdue her enemies, but it is a defensive tool. She is feminine but is clearly strong enough to subdue anybody that dares to cross her. She is, in the truest sense of the word, awesome. I may be excited to see her new movie, but I’m more excited to dive deeper into her world. I threw some flat colors on the drawing because I loved the movie a lot and couldn’t stop obsessing over the drawing.